Osho is a mystic who brings the timeless wisdom of the East to address the urgent questions facing men and women today. He speaks of the search for harmony and wholeness that lies at the core of all religious and spiritual traditions, illuminating the essence of Christianity, Hassidism, Buddhism, Sufism, Tantra, Tao, Yoga and Zen. Osho's vision is a new man. After his enlightenment in 1953, the evolution of that new man became his whole work. In 1963 he left the academic world where he had taught philosophy at the University of Jabalpur and began speaking to tens of thousands across India. He then focused intensely on developing tools for man's transformation. Modern man, he said, is so burdened with traditions of the past and anxieties of modern day living, that he must go through a deep cleansing process before he can begin to discover the thought-free relaxed state of meditation. In 1974 a campus was established around him in Pune, India. A trickle of visitors from the West soon became a flood. Today this campus has become the largest spiritual-growth center in the world. It attracts thousands from around the world to it's meditation, therapy, bodywork and creative programs. In the course of his work, Osho speaks on virually every aspect of the development of human consciousness. His talks cover a staggering range from the meaning of life and death to the struggles of power and politics, from the challenges of love and creativity to the significance of science and education. 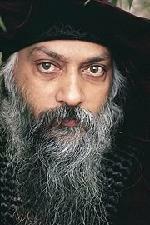 Osho does not want to be considered a religion, nor does he want his disciples to surrender to him. With love and non-judgment he invites us to reconnect with and surrender to our own inner guru, supporting us to move toward a more joyous and less stressful life. The unique Osho Active Meditations are designed to allow the release of accumulated stress in the body and mind so that it is easier to be still and experience the witness state of being: meditation. Osho characterized his new man as Zorba the Buddha: living in awareness, with a capacity to celebrate everything in life ~ one who's feet are firmly on the ground, yet whose hands can touch the stars. Osho was born in India in 1931 and left his body in 1990.